He recently spoke of his concerns about coping with a potential fifth child with wife Hilaria. And Alec Baldwin did indeed appear to have his hands full on Friday, when the actor took a stroll around SoHo with his yoga teacher wife and their quartet of kids. 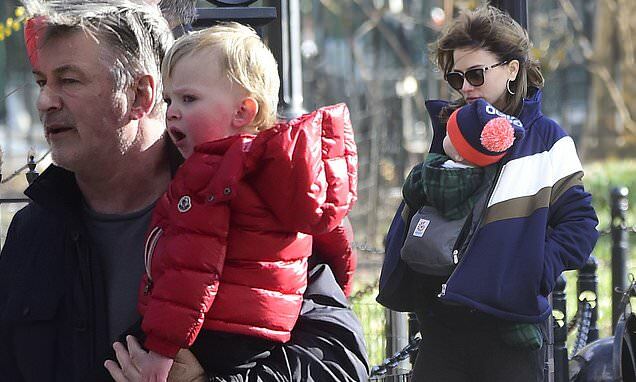 The 60-year-old Saturday Night Live regular looked a little weary as he carried two-year-old son Leonardo on the family stroll. The Glengarry Glen Ross star's wife carried their newest bundle of joy, ten-month-old Romeo. They were trailed by their older kids, daughter Carmen, five, and son Rafael, three, who were accompanied by a nanny. Alec also has one adult child, 23-year-old Ireland Baldwin, whom he shares with ex-wife Kim Basinger.